It’s finally here, the moment I’ve been waiting for: ZINCON 2016! The Zumba® Instructor Network Convention has been the talk of the year amongst Zumba instructors worldwide. In our world, it’s the most secretive, yet thrilling, event of the year. Being a participant in the buildup to this convention reminded me that event marketing is an opportunity to leverage in-person engagement and build relationships with your customer. In planning, every company’s approach will differ, but your execution has to be tight. Your overall goal is always to make an impact on your customer, and Zumba is a fantastic example of how to do that. As a new instructor myself, all I’ve heard over the last few months was how valuable and fun ZINCON has been in previous years, which only made me want to Zumba my way there! 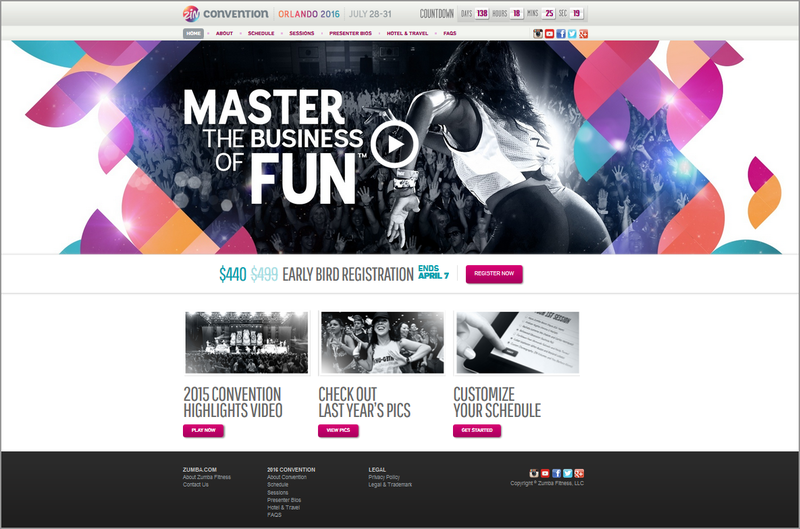 As I went through the process of registering for this event, I wanted to share three tips I found interesting in Zumba’s promotion of this special convention. Cross-promotion is when you have a strategy to distribute your message to increase the odds of customers hearing about it through multiple channels — email, social, mobile and Web. However, utilize only the mediums that are relevant to your company and customers, whether it be for events, contests, blog content or promotions. Email is the premier medium for targeted and personalized invitations, and can make or break an event. Zumba promoted only through email to target the licensed instructors on its list. The moment the first email was delivered, word spread through social media about the upcoming event. And because it was easy to access the information, it was beneficial for both the company and the instructors to engage and promote the convention. Along with using the appropriate medium, know your audience and supply them with content they are looking for. Email invitations should have a professional appearance, with eye-catching graphics, an effective subject line and relevant content. The main focus is to build a content strategy with an editorial calendar, social plan and measure for success. As an attendee, I appreciated how clean and functional the website was. It contained very compelling elements and all the information I needed. The only thing missing was a mobile-friendly site, which is a huge factor these days. Make sure your website and sign-up process are mobile responsive so you don’t lose those visitors. o Why should your ideal customer attend your event and not another competing event? o Is it the first thing visitors see, and is it conveyed in about 10 seconds? o Is your hero shot effective enough to stand out from all the text? o Does your video help tell a story in a short amount of time? o Are you projecting excitement to peak the audience’s interest? o Is your description brief and digestible? o Have you convinced customers that their needs are being addressed? o Are you showing customers the exact benefits the event can offer? o Is the goal on the landing page a clear and solid prominent button? o Does your CTA drive conversions? o What can you A/B test? As ZINCON requires dance space, limited slots per session drove urgency behind registration. Instructors received an email a few weeks prior to the opening day of registration, and buzz filled my social media timelines. If your event permits, have attendees sign up for the onsite sessions in advance. Establishing a deadline is crucial in this initiative, and use time-sensitive language in the email. If you can’t afford to move in that direction, create a sense of scarcity. Notify the customers from the very beginning that if they don’t act fast, they might lose out. Pricing periods can also be an effective way to encourage fence-sitters to jump over and join in on the fun.For example, advertise when you have only a certain number of tickets left at a certain price point, or when there are only a few days left to benefit from a promotion. Be warned: Using this technique in a deceptive way can have a negative effect on your event. Check out this study from our sister company MarketingExperiments on that shares tests and insights on how leveraging urgency could increase conversion rates. In the end, your event has to leave an impression on all the stakeholders involved. Keep driving the communication where necessary to your customers to engage them. Planning any event won’t always be easy, but start small and work on the challenging aspects. Since it’s my first time attending ZINCON 2016, I don’t know exactly what to expect. Though, I do know one thing: The initial email I received, website and seamless process have all been key parts in my decision to register for this convention.